For use in large volume cell fusion applications such as hybridoma production, the ECM 2001+ generator, 2 ml optimization coaxial chamber, and 9 ml production coaxial chamber are used. 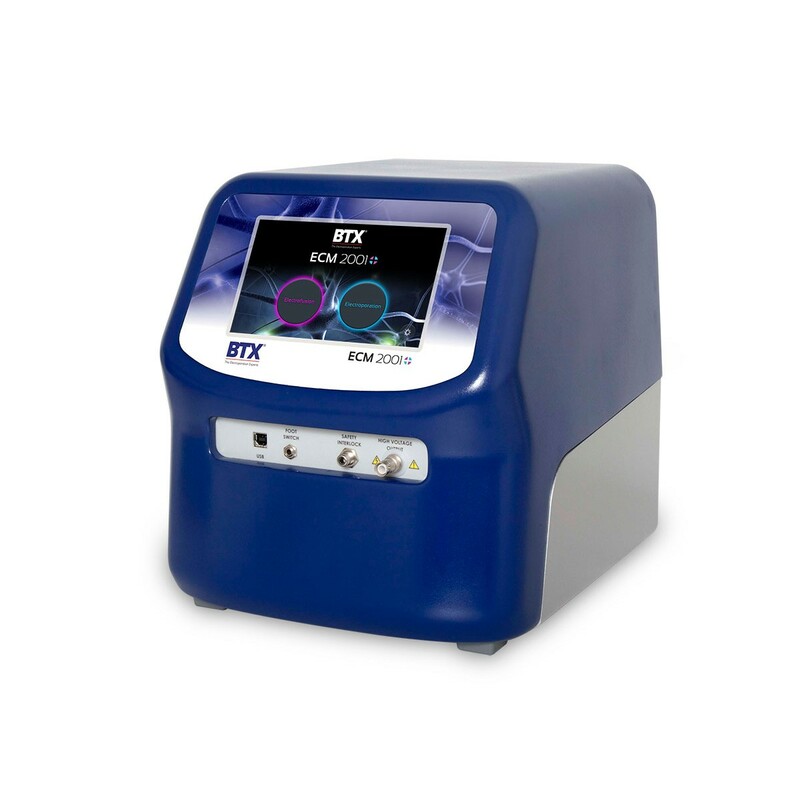 This system (45-2048) does not require proprietary fusion medium, but can be used with the Cytofusion Medium C for convenience. Coaxial chambers (47-0030, 47-0020) are also available for purchase separately. Kim, GA, et al. Generation of CMAHKO/GTKO/shTNFRI-Fc/HO-1 quadruple gene modified pigs. Transgenic Res. 2017 Aug;26(4): 435-445. doi: 10.1007/s11248-017-0021-6. Epub 2017 May 28. Sper RB, et al. Generation of a Stable Transgenic Swine Model Expressing a Porcine Histone 2B-eGFP Fusion Protein for Cell Tracking and Chromosome Dynamics Studies. PLoS One. 2017;12(1): e0169242. Xie Z, et al. Optimization of a CRISPR/Cas9-mediated Knock-in Strategy at the Porcine Rosa26 Locus in Porcine Foetal Fibroblasts. Sci Rep. 2017 Jun;7: 3036. doi: 10.1038/s41598-017-02785-y. An L, et al. Efficient Generation of FVII Gene Knockout Mice using CRISPR/Cas9 Nuclease and Truncated Guided RNAs. Sci Rep. 2016;6: 25199. doi;10.1038/srep25199. Bakhshi PK, Bain J, Gul MO, Stride E, Edirisinghe M, Staniland SS. Manufacturing Man‐Made Magnetosomes: High‐Throughput In Situ Synthesis of Biomimetic Magnetite Loaded Nanovesicles. Macromol Biosci. 2016;16: 1555-1561. Huan, YJ, et al. Alteration of the DNA methylation status of donor cells impairs the developmental competence of porcine cloned embryos. Journal of Reproduction and Development. J Reprod Dec. 2016 Feb;62(1): 71-77. Jeong, YH, et al. Knock-in fibroblasts and transgenic blastocysts for expression of human FGF2 in the bovine β-casein gene locus using CRISPR/Cas9 nuclease-mediated homologous recombination. Zygote. 2016;24(3): 442-456. Lu D, et al. Large-Scale Production of Functional Human Lysozyme from Marker-Free Transgenic Cloned Cows. Sci Rep. 2016;6: 22947. doi: 10.1038/srep22947. Sun, Y, et al. Deletion of a Yci1 domain protein of Candida albicans allows homothallic mating in MTL heterozygous cells. mBio. 2016 Apr;7(2): e00465-16. Natalie J, et al. H7N9 influenza virus neutralizing antibodies that possess few somatic mutations. J Clin Invest. 2016 Apr;126(4): 1482-1494. Wang K, et al. Efficient Generation of Orthologous Point Mutations in Pigs via CRISPR-assisted ssODN-mediated Homology-Directed Repair. Mol TherNucleic Acids, 2016 Nov;5(11): e396. Mangan, PR, et al. Dual inhibition of interleukin-23 and interleukin-17 offers superior efficacy in mouse models of autoimmunity. J Pharmacol Exp Ther. 2015 Aug;354(2), 152-165. Ruiz N, et al. Non-Invasive Delivery of dsRNA into De-Waxed Tick Eggs by Electroporation. PLoS One. 2015 Jun; 10(6): e0130008. Wang, K, et al. Efficient generation of myostatin mutations in pigs using the CRISPR/Cas9 system. Sci Rep. 2015 Nov;13(5): 16623. Wang Y, et al. MiR-499 Enhances the Cisplatin Sensitivity of Esophageal Carcinoma Cell Lines by Targeting DNA Polymerase β. Cell Physiol Biochem. 2015;36: 1587-1596. Wu H, et al. TALE Nickase-Mediated SP110 Knockin Endows Cattle with Increased Resistance to Tuberculosis. Proc Natl Acad Sci USA. 2015 Mar;112(13): E1530-1539. Zhang XH, Lian XD, Dai ZX, Zheng HY, Chen X, Zheng YT. α3-Deletion Isoform of HLA-A11 Modulates Cytotoxicity of NK Cells: Correlations with HIV-1 Infection of Cells. J Immunol. 2015 Sep;199(6) :2030-2042. Lai CW, et al. FTSJ2, a Heat Shock-Inducible Mitochondrial Protein, Suppresses Cell Invasion and Migration. PLoS One. 2014 Mar; 9(3): e90818. Zhang Y, Luo W, Wang Y, Liu Y, and Zheng, L. Purified dendritic cell-tumor fusion hybrids supplemented with non-adherent dendritic cells fraction are superior activators of antitumor immunity. PLoS One, 2014;9(1), e86772. Liu X, et al. Zinc-Finger Nickase-Mediated Insertion of the Lysostaphin Gene into the Beta-Casein Locus in Cloned Cows. Nat Comm. 2013;4: 2565. Tan, C, et al. Impact of anti-CD25 monoclonal antibody on dendritic cell-tumor fusion vaccine efficacy in a murine melanoma model. J Transl Med. 2013 Jun;11: 148. Wang Y, et al. Mir-655 Up-Regulation Suppresses Cell Invasion by Targeting Pituitary Tumor-Transforming Gene-1 in Esophageal Squamous Cell Carcinoma. J Transl Med. 2013;11: 301. Clow A, Gaynor P, Oback, B. A novel micropit device integrates automated cell positioning by dielectrophoresis and nuclear transfer by electrofusion. Biomed Microdevices. 2010 Oct;12(5): 777-786.